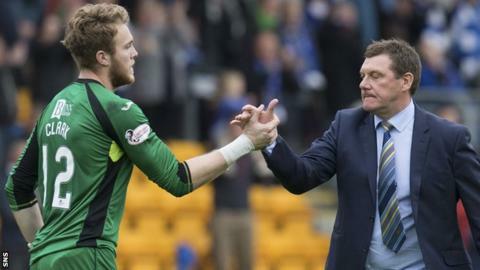 St Johnstone have announced a contract extension for goalkeeper Zander Clark but insist it was agreed before the 23-year-old made his first-team debut. He came on against Dundee United after Alan Mannus was sent off. And, with the Northern Irishman suspended, Clark made his first start in Saturday's 5-1 win away to Scottish Premiership leaders Aberdeen. Clark told St Johnstone's website: "The deal was agreed a couple of days before the Dundee United game." He said that, having extended his contract until summer 2018, he wants to challenge for a regular starting place after "a special couple of weeks for me". Clark came through the youth ranks at McDiarmid Park and has had loan spells with Elgin City and Queen of the South. Manager Tommy Wright said: "I've said from the start of this season that I have two number one keepers at my disposal and that's a great position to be in. "We've been speaking to Zander for a few weeks and agreed the deal just before the Dundee United match. "So there was an irony that, a couple of days later, Zander got his chance due to Alan's sending off. "He did well that day and again at Pittodrie and I am delighted the club has been able to extend his contract."